If you own a home or other property in town, you should be getting an individual tax assessment for it in the mail within a few days, Darien Tax Assessor Anthony Homicki said on Tuesday. The revaluation estimate of the taxable worth of your property will be used in calculating your future town property bills, which apply the town tax rates to assessed value. The Tax Assessor’s Office posted the 2018 Revaluation Notice, a news release, on its Web page on the town government website. It’s several pages long and discusses the entire revaluation process in detail. The statement is also being mailed with the individual tax assessments, he said. We’ve republished it below. Darien Tax Assessor Anthony Homicki also spoke to the Board of Selectmen about the revaluation at the board’s Tuesday night meeting. 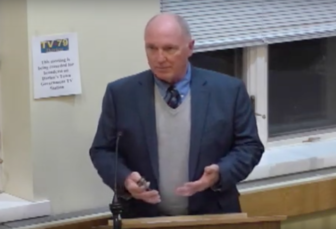 Darien Tax Assessor Anthony Homicki spoke to the Board of Selectmen on Tuesday about this year’s tax assessment and the notices going out to town taxpayers. Homicki said the revaluations have been done by a reputable company that the town has used before and show relatively small changes in property values overall, across town. As mandated by the State of Connecticut’s General Statutes, commercial and residential property owners will receive a letter by the end of November from the Office of the Assessor, showing the change in your assessment. Under Connecticut state law, all properties are to be revalued every five years. Darien’s last update was completed Oct. 1, 2013. Darien first performed this effort in a computer medium (going from a penciled manual record) in 1999, transferring a variety of building and land features into an appraisal database. This automated information was enhanced during the 2003 revaluation with a updated computer assisted mass appraisal (CAMA), with further refinement in 2008, when this CAMA system integrated a centralized database with the Building Department’s software, inclusive of digital photography. In 2013, we further integrated a variety of systems including CAMA, photos using GPS technology, mapping technology (GIS), and imagery known as Pictometry systems, which gives a 3D view of each of Darien’s 7,000 parcels. In fact, since 2013, these systems has been updated daily. Why are properties assessed at 70% of fair market value? In 2013, we further integrated a variety of systems including CAMA, photos using GPS technology, mapping technology (GIS), and imagery known as Pictometry systems, which gives a 3D view of each of Darien’s 7,000 parcels. In fact, since 2013, these systems has been updated daily. Why are properties assessed at 70 percent of fair market value? So your first task in understanding the Assessor’s letter is to divide your new assessment by 70 percent. This will give you the gross appraised value of your property. The Assessor’s Office is mandated by state statute to review and identify all sales for a variety of assessment purposes. With the certified appraisers/consultants hired by the Town this office has identified over 600 sales which are now the basis for defining and defending the updated assessments. The overall objective of this five-year mandate is to establish parity and consistency for all of Darien’s real estate. Is your assessment fair? The best way to answer this question is to review the sales that have occurred, not only in your immediate neighborhood, but also throughout the Town of Darien. In some situations, some appraisers have to go outside of the borders of Darien to find comparables, especially for unique homes and commercial properties. You should look for recent sales that are much like your house, which have the same type of property, the same room count, be it the number of bedroom and bathrooms, and comparable age and possibly the same type of neighborhood. Much of this information and more can be found on the Town’s website. A shortcut to the Property Record Card online is assessment.darienct.gov. Many of the local real estate agents and brokers also have an incredible amount of detail on their own websites that you might find helpful. What does this updated assessment actually mean to me? What will this refined 2018 assessment mean to my July 2019 tax bill? Yes, “WE” all ask this question (even your assessor owns a house). There is no way to exactly determine how it would compare to your bill from last year until the certified Grand List is finalized by the Assessor, which will occur on Jan. 31 and until after results of hearings on appeals to the Board of Appeals are processed, followed by the full budget process with the setting of the mill rate during the spring of 2019. The average residential assessment has remained stable since our last 2013 update – depending on the specific neighborhood that you live in. Generally speaking, entry level homes, which are values in the range of $700,000 to $1,500,000, are in a range of 3 to 4 percent, both up and down since 2013. We have seen homes in the 2-acre zone neighborhoods stay on the market for as long as 200 days, with some sales showing sizable market changes. These facts are based on the inspection and scrutiny of the multiple listing service and discussions with local brokers on over 608 sales over the past 24 months that were used for setting these assessments. You might be above the average or below the average, but the values are based on the features of each parcel and the specific features of your home itself. You might say that the prices have stabilized or have even gone up since 2013, but the fact shows that as of Oct. 1, on average, most properties are very close to the 2013 values. But we want to know the mill rate now? If the total tax base remains stable then we should see the FY19-20 mill rate stay fairly close to the present 16.08 mills, but we must remember that this is subject to hearings and budget deliberations and numerous other impacts on the budget. Let’s complicate the formula a little further and incorporate the assessments of 1,100 business personal property (business furniture fixture and equipment) and 17,800 vehicles that are updated annually. All three parts of the pie relate directly in the final grand list reconciliation. Darien economic trends over the past 30 years. Over the past several years it has been stated by Core Logic-Shiller Home price indexes that the State and Local Tax (SALT) effect seems to be showing up in the New York/Connecticut metropolitan region in a negative way, that the federal deduction cap of $10,000 has had an effect on the market. This just might be, but what makes Darien a very special place are its unique neighborhoods. Darien, like much of Fairfield County, has changed over the past 30 years. We’ve seen significant growth within our residential neighborhoods and significant changes along the Boston Post Road, uniquely enhanced with downtown development, newly constructed commercial offices, and a variety of fine dining restaurants which occurred from 2006 through 2011 and continues today. The two Heights commercial redevelopments (Federal Realty and Noroton Heights Shopping Center) and the downtown Baywater project will only supplement the tax base in Darien. The Affordable Self-Storage project and the Parklands continuing care facility known as The Residence @ Selleck Woods will increase the tax base by millions of dollars. Darien continues to have its own character, being a waterfront community influenced by tidal coastal concerns both positive and negative, wonderful marshlands with preservation areas owned by the Darien Land Trust, as well as open land covenants established by our Country Clubs and the Ox Ridge Hunt Club. We have a Master Plan of Conservation and Development that advocates positive growth, with sensitivity to each and every neighborhood. Housing values in Darien have generally grown faster than the rate of inflation over the past thirty years. Generally speaking, commercial properties do not appreciate in value as much as residential property. This year is typical of past years for both residential and commercial parcels. Personal Property and Motor Vehicles are not a large factor in the Grand List of Darien. 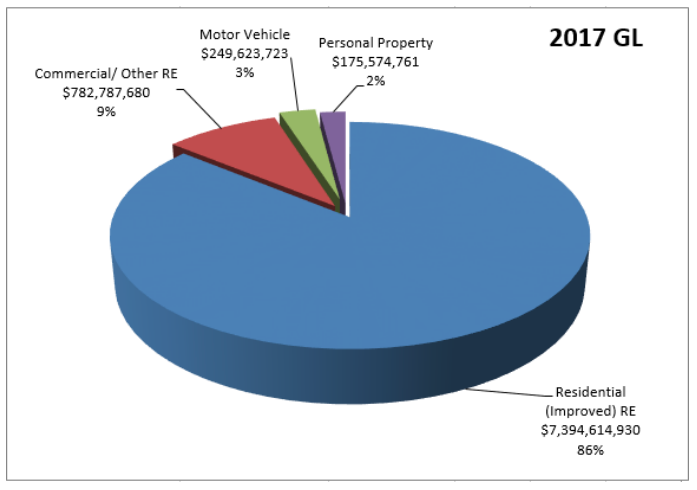 The following charts show how uniform Darien is relying on residential property. So let’s revisit this process. The mill rate, and therefore your property taxes, are determined by dividing the revenue which must be generated through taxes, by the value of the Grand List. Whether or not your individual taxes go up or down depend on how your share of the pie has changed relative to the 2013 Grand List. If the real estate portion of the Grand List goes down then those who own motor vehicles may see a slight increase in their motor vehicle tax bills. Note that motor vehicle values are updated annually by the Assessor in accordance with State Stature. Therefore, for an average home whose new assessment remains stable, if the mill rate is proportionally affected, then your tax will potentially remain the same. Might you want to know more about the revaluation process? The town website has an updated question and answer section as well as property records online and also a list of valid arms length sales information. Assessor Anthony Homicki encourages all to go online and see if your questions can be answered. A link to Section 12 of the General statutes is also provided on the Assessor’s [Office] Web page. If more detail is needed the Assessor suggests visiting the Connecticut Association of Assessing Officers website at caao.com. The Grand List is not necessarily static. It is a snapshot of the Town on October 1st, but it does change thereafter. For example, changes occur when an application to the Board of Assessment Appeals is successful, errors or omissions are found, and when new or renovated buildings are added to the tax rolls. Real Estate (Commercial and Residential). Revaluation in Darien continues on a dayto day basis. The update to this Grand List is with the assistance of a highly rated national revaluation company Tyler Technologies. The oversight of this process is performed by the Assessor and the staff within the Assessor’s Office having over 60 years of experience with 11 revaluations completed. The experienced staff in this office has set the preparatory work and has maintained quality control checks on the vendor. Each property was viewed twice. The first viewing has been over the past five years by Mr. Homicki’s staff, who confirmed the basic data and updated many photos for sales and these parcels that have had permit work. The second review was done by the vendor personnel, monitored by town staff. The Tyler Company contract required updated photos of every parcel in town. They looked at each property, the neighborhood within each parcel, and then reviewed the methodology used to arrive at the market value. This is a very labor intensive process. Residential appraisals rely on the sales approach combined with the cost approach to value. For commercial properties the cost and income approaches are strengthen further by our analysis of regional commercial sales inclusive of most all of Fairfield County. Motor Vehicles start with a listing from the State of all registered vehicles on Oct. 1. The valuation is established each Oct. 1 with the State Office of Policy and Management approving the NADA appraisal guide as recommended by the Connecticut Association of Assessing Officials, using a computer exchange identifying the 17 digit Vehicle Identification Number (VIN) for most of all 3,000,000 vehicles registered in Connecticut. Personal Property assessments are accomplished by the Assessor with the annual filing of a declaration of asset ownership by each and every business in Darien, primarily on office equipment and fixtures. Every business — including a home business — which has a laptop, a desk or a file cabinet is obligated by State law to complete an inventory with the Assessor and pay a property tax accordingly. Meet with the revaluation appraiser. The notice of assessment change will be mailed to all property owners in November, 2018. Informal appeal hearings are available by calling the Tyler Technology appraisers. Formal appeals of the change in assessment can be made by filing an appeal application with the Assessor’s Office on or before Wednesday February 20, 2019.